The Fremco Trust received a welcome fund injection on 16 November. Present at the handover were (FLTR): Louis Cloete (Trustee: Fremco Trust), Wendell Jephtah (Trustee: Fremco Trust), John Hesom (Director: Frandevco), Bruce Berry (Chairman: Frandevco), Herman van der Merwe (Director: Frandevco), Ralph Damonse (Fremco Administrator), Dirk Hattingh (CEO: Frandevco), Dawie De Villiers (Trustee: Fremco Trust), Norval Williams (Chairman: Fremco Trust), Marion Adams (Trustee: Fremco Trust) and Ruth Morgan (Trustee: Fremco Trust). 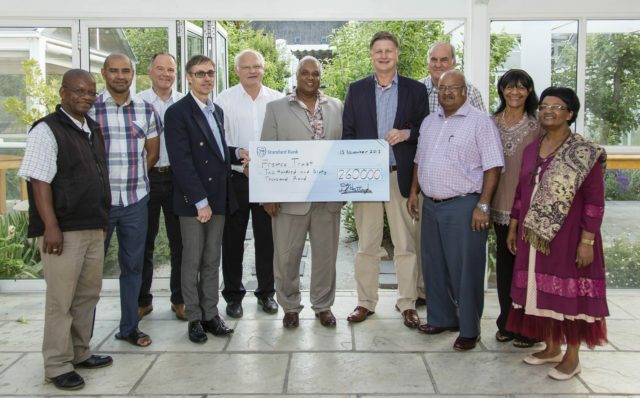 The Franschhoek Country Club Estate Development Company (Pty) Ltd (Frandevco), developers of the Fransche Hoek Estate, handed over a financial contribution to the Fremco Trust, which represents community-based organizations in Franschhoek. The development of the Fransche Hoek Estate flowed from a social compact that was signed in 1998 by stake holders, including the then Franschhoek Municipality, as part of the Franschhoek Empowerment and Development Initiative (FEDI). Fremco each year awards bursaries to children from the Franschhoek community and donates a percentage of its income to the Mont Rochelle Nature Reserve. The project was financed by the Development Bank of Southern Africa (DBSA) and implemented by Frandevco. A unique development model was used, which is being used on other projects in South Africa as well. At the time of its formation the activities of the Fremco Trust were endorsed by President Nelson Mandela. 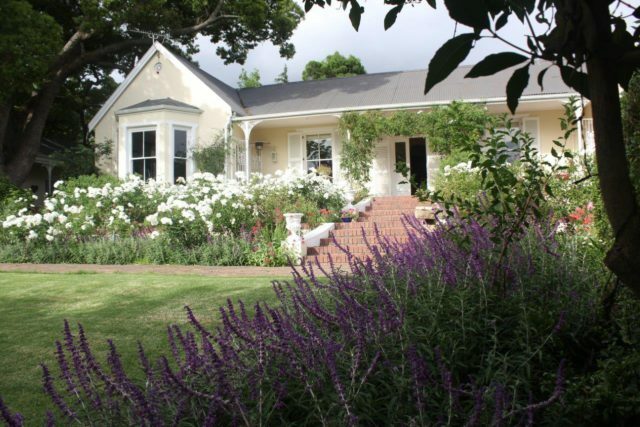 Boschendal offers all that you’d expect of a wine estate – restaurants, wine tasting, picnics – and then some! Also on offer are half and whole day spa treatments, walking and mountain bike excursions (on 30 km of new trails), fly fishing – and horse riding. It can be stated quite categorically here that if ever there was an enthusiastic team it is that which now runs the equestrian activities. The equestrian team is headed by Hans Mbalula and his brother Petrus. Hans was formerly a barman at Boschendal’s deli/Werf restaurant/picnics), but on hearing Boschendal’s CEO discussing the pros and cons of riding and related activities on the estate he immediately volunteered to give up bartending and to run this new initiative. It transpired that he had, in fact, been raised on a Free State farm and as a boy had ridden regularly before and after school to carry out a variety of farm duties such as cattle and sheep herding. He had, too, it was discovered, learned early on how to win the confidence and calm down a wild horse so that within a few days (often in fact within one day) he could saddle and ride it without any of the bronco busting histrionics of the Wild West’s cowboys. He had also learned how to put horses into harness to pull a cart or a plough, again using a minimum of force and a maximum of coaxing. Boschendal now has 13 horses, including a few Shetland ponies, the majority of which are massive Shire horses, Friesians, Clydesdales and Percherons, all of them giants of the horsey world – they grow to 16 hands or more. Being immensely strong, they are capable of carrying a 100 kg or 110 kg rider in armchair comfort. Surprisingly, however, they are also quite exceptionally gentle so that, despite their size, they can be and sometimes are ridden by quite small children. A few lucky riders are offered the opportunity to mount these massive horses, but most of Boschendal’s outrides are done with well-trained smaller horses. Today the Boschendal horses can be hired for outrides and these usually take the visitor into unspoilt conservation fynbos territory where waterbuck and eland have been introduced by Boschendal’s owners. For those prepared to rise early Boschendal offers a breakfast ride in its extensive conservation territory with delicious eggs, bacon and mushrooms cooked over an open fire. The rides can last up to three hours and afford the visitor a total escape from the overcrowded mechanised world. Shire horses are, however, at their most impressive when they are acting as draught animals. Their huge size make it possible for them easily to pull carts, the weight of which would bring lesser horses, even fully trained hackneys, to their knees. 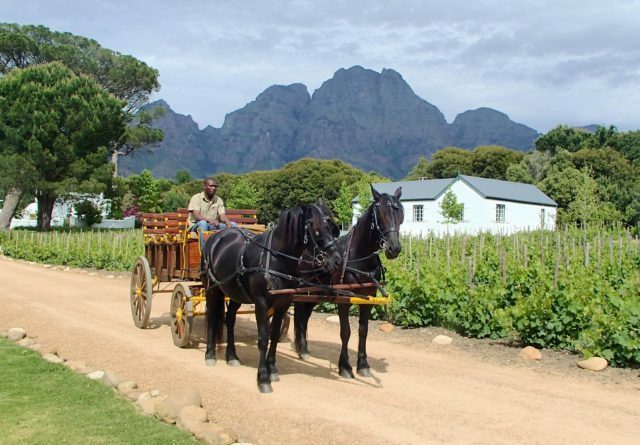 At Boschendal the management now offers visitors one-hour cart rides almost daily. The carriage can take a small number of adults and a larger number of children. Passengers sit on a beautifully restored 19th-century landau and this gives them a tranquil lovely way to see the estate and to watch these big horses working so willingly. The foremost carriage pair are black Friesian mares. They are sisters and are named Queen Victoria and Queen Elizabeth. Their names are appropriate because they exude a patrician, almost regal ambience, as if aware that they are several cuts above today’s typical livery stable animals. 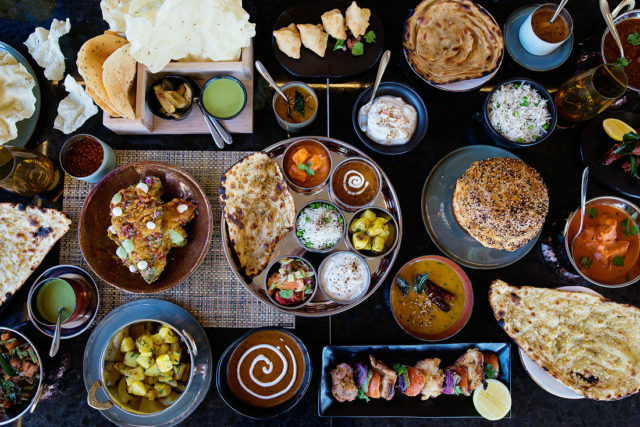 Marigold, Franschhoek’s first authentic Indian cuisine restaurant, opened its doors on 8 December 2016. The opening coincided with the launch of Heritage Square, a proud new addition to the Leeu Collection portfolio. The brand new restaurant offers a feast of exotic flavours that will delight any gourmand. Marigold’s small-plates menu is inspired by the aromatic and spicy North Indian cuisine. Look forward to rich, fragrant curries and flavourful biryanis with succulent meat dishes that are cooked in a charcoal tandoor. Seasoned chef Vanie Padayachee hails from Durban and was most recently a part of the Le Quartier Français culinary team. She has been integral in the opening of various restaurants as well as a cooking school in South Africa. To begin your meal consider a selection of Indian savoury appetisers before enjoying one of the restaurant’s signature main dishes. The layered rice Biryanis offer a delicious and complex level of flavour, while the curries offer something for everyone – delicious vegetarian options, tender chicken and slow-cooked lamb. Enjoy succulent prawns, line fish, chicken or beef kebabs cooked to perfection in the charcoal tandoor. Each dish is accompanied by a variety of traditional Indian bread, rice, salad and raita. The interior, with its exposed brickwork, timber flooring, bold geometric wallpaper and African inspired fabrics offers banquette-style seating for 60 guests. Slatted dividers offer privacy, yet maintain the feel of a magnificent feast. The restaurant also has seating outside in the Heritage Sqaure courtyard for a further 20 guests. Leeu Collections’ iconic signature statue of a lion by acclaimed sculptor Jop Kunneke is the focal point of the courtyard. The lion is a reference to Leeu Collection’s founder, Analjit Singh, as “Singh” means lion in Sanskrit (“leeu” in Afrikaans). Marigold, located on Heritage Square, 9 Huguenot Street, will be open seven days a week for lunch from 12h00 to 15h00 and dinner will be served between 18h00 and 22h00 (although times might change during the quieter season). Born out of synchronicity, fortuitous friendships and a love of wine, Black Elephant Vintners has extended that passion into partnering its wine collection with a crafted menu dégustation. The result is a food and wine collaboration with Ryan’s Kitchen, situated at 1 Place Vendôme in the Main Road. Available Monday to Saturday at lunchtime (12h00 and 15h30), patrons have the option of a four- or seven-course taster menu, created exclusively by Chef Ryan Smith. 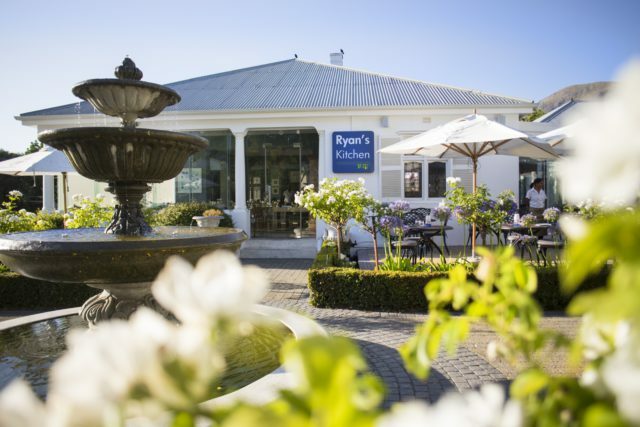 The wine and food collaboration is hosted in the Tasting Studio situated within Ryan’s Kitchen. Each wine and food combination has been masterfully selected and paired by owners of Black Elephant Vintners, Kevin Swart and Jacques Wentzel, together with Chef Ryan. The menu dégustation displays the chef’s ability to seamlessly create taste and flavour sensations. Their diverse brand portfolio enables BE Vintners to provide a range of wines with unique physical characteristics that appeal to different desires, tastes and occasions. They even offer wine and music pairings aptly named Wine Unplugged at their cellar. For patrons who only want wine tasters, the Tasting Studio will be open Monday to Saturday from 11h00 to 16h30. Four wine tasters cost R75 and seven R125. (R235 and R330 if served with the menu degustation.) Bookings for the Black Elephant Vintners Tasting Studio are essential. Alisha Erasmus, Lee-Ann Fouche-Wessels, Nick Oosthuizen and Chris Erasmus of Foliage at the 2016 Eat Out Mercedes-Benz Restaurant Awards. South Africa’s best culinary talents were honoured at the 2016 Eat Out Mercedes-Benz Restaurant Awards on Sunday, 20 November. Franschhoek restaurants didn’t win any of the big prizes, but were well represented with three claiming places among the top 10. They are: The Tasting Room at Le Quartier Français (4th), The Kitchen at Maison (8th) and Foliage (9th). For an unprecedented fifth consecutive year, The Test Kitchen was named Restaurant of the Year. Gregory Czarnecki of The Restaurant at Waterkloof won the coveted title of Eat Out S.Pellegrino & Acqua Panna Chef of the Year. La Colombe was recognised for maintaining the highest level of service with the Eat Out Nespresso Service Excellence Award and the first-ever Eat Out John Psillos Award for Outstanding Contribution to Service, which was awarded to front-of-house manager Jennifer Hugé. The much-admired chef, restauranteur and author Peter Veldsman was the winner of the Eat Out Lannice Snyman Lifetime Achievement Award. The Eat Out Nederburg Rising Star Award went to Angelo Scirocco of Urbanologi in Johannesburg for his promising talent, and the Eat Out Wine Service Award for a top sommelier was won by Tinashe Nyamudoka of The Test Kitchen. In another industry first, The Table at De Meye in Stellenbosch was the recipient of the inaugural Eat Out Woolworths Sustainability Award, which recognises a restaurant that is making strides towards sustainability by implementing environmentally and socially responsible practices and being cognisant of the importance of higher animal welfare. 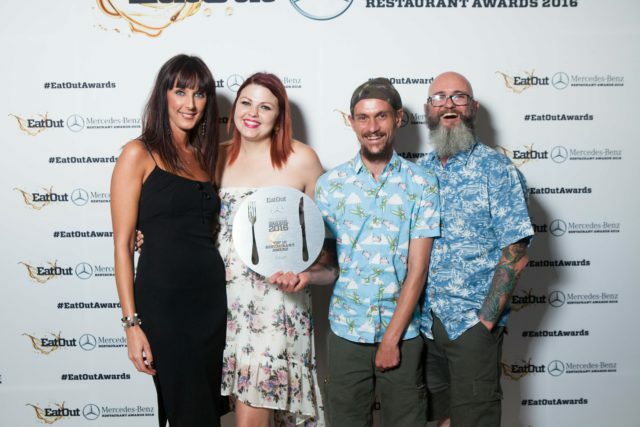 Foxcroft, the new restaurant opened by chefs Scot Kirton and Glen Williams of La Colombe, was named the Eat Out Retail Capital New Restaurant of the Year. Marble in Rosebank, Johannesburg, received the Eat Out Boschendal Style Award for its show-stopping interior design and décor. The winner of the Woolworths TASTE Eat Out Bursary was Ayanda Matomela, who was selected for his passion and enthusiasm. On the evening of 1 December Dalena Roux was taking her usual walk around the Reservoir Street dam when her dog Jessie drew her attention to an owl, sitting on the ground behind the bench on the dam wall above the school tennis courts. It was not clear whether the bird was hurt although it seemed unable to fly and scrambled around in the scrub. 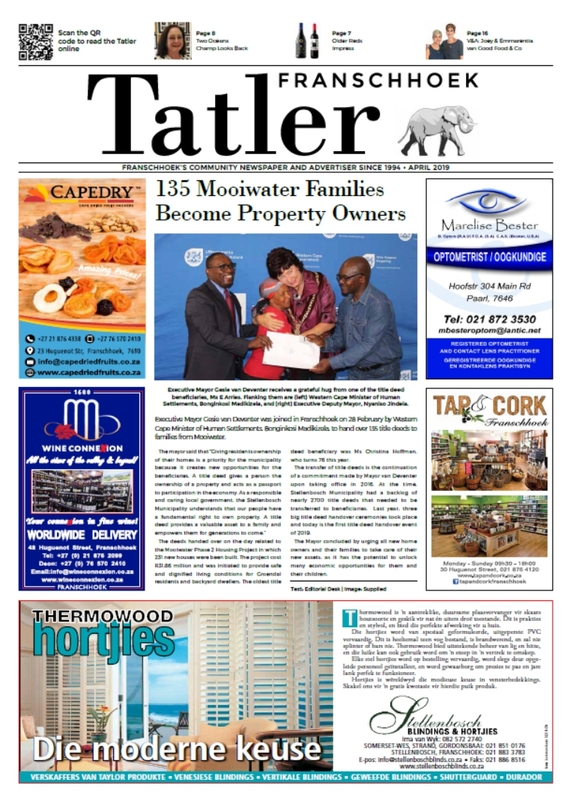 Concerned that dogs could attack and harm the owl, Dalena called the Tatler. We immediately called Ina Els who regularly walks at the dam in the evenings and is used to dealing with animals. She was on her way to the scene within minutes. We then called Nick Norman who lives next to the dam. The “Nick, there’s a crisis at the dam can you go there immediately?” call alarmed him, as he knew of the fire at the Berg River Dam where a number of people had fought a brave fight the previous night. When he realised the dam in question was the one next to his house and an owl was in trouble, he grabbed a towel and joined Dalena and Ina. The frightened Spotted Eagle Owl was not easy to catch but was outsmarted by the intrepid trio, assisted by Ben Astfalk who had come with his father Jeremy and joined the rescue party. It turned out to be a juvenile that was not injured but could not yet fly. Nick took it home in the towel and put it in a box supplied by Jeremy, where it was safe and dark. Caro Iuel, a passionate and experienced animal carer, came to have a look and suggested that the owl be taken to Spier. That is exactly what happened and the young bird was put in a big aviary with other owlets and surrogate mothers who feed them. When the Franschhoek owl can fly and is ready to be released, Nick will fetch it and bring it home where it can live a natural life in ‘wild’ surroundings. Nick has asked residents who come across an owl, or any other helpless, vulnerable bird around the dam, to call him immediately on his cell phone (083 287 5756) to see whether the bird can be successfully rescued. 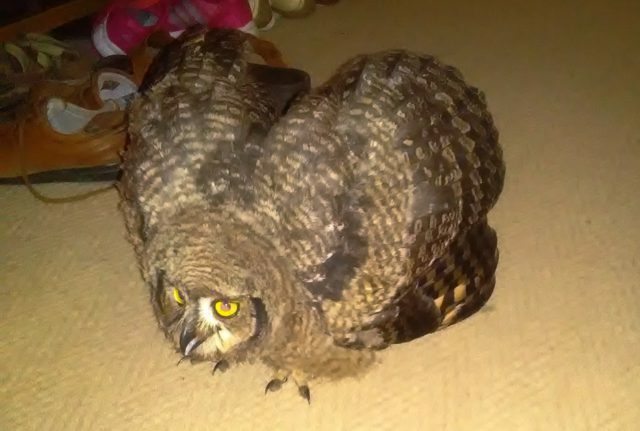 Kudos to the Franschhoekers who went out of their way to rescue one of our beloved Spotted Eagle Owls and give it the best possible chance of a good life. Superficially blocks S and T of the Langrug informal settlement may look much the same as the other blocks. Looking a little deeper though, one soon discovers that something exciting is happening here and the differences suddenly become obvious. Plastic litter that seems to be everywhere in the settlement is absent here. So are the open streams of foul wastewater. The path between the shacks has a curb to give it a level surface and channel storm water to the nearest storm water drain. Perhaps most strikingly the informal road is paved with open grass pavers and there are large indigenous trees every few metres along the road. The reason for these differences is a project called The Genius of SPACE. This project is part of the Western Cape’s 110% Green Initiative and the Berg River Improvement Plan. It seeks to address two of the province’s strategic priorities: water quality in the Berg River system and the green economy. What the project is doing is establishing innovative biomimicry interventions that when applied, successfully adopted and implemented to the Berg River area, could have a desirable impact on the province’s environment and economic growth as well as improving health in all the people affected by the river. The project has been through several phases involving community participation and co-planning, with phase 4 (construction) finally starting in January 2016. The aim is to mimic nature in creating a living sewer, using the principle of treating water as it is transported to support the greening of Langrug with readily available nutrients and water. Briefly the system works as follows: A series of greywater disposal points have been constructed and linked via underground pipes to miniature wetlands and tree gardens – hence the absence of open sewers. These specially designed wetlands start purifying the water as it moves down the slope from wetland to wetland and ultimately to the municipal sewer system. The system is maintained by the community it serves and they also ensure that everybody follows the rules needed to keep the system functioning healthily and correctly. The project includes monitoring and research by postgraduate students funded by the Department of Science & Technology and the Water Research Commission. Every aspect is being documented with the aim of learning as much as possible. Lessons learned will determine the feasibility of implementing this within the whole community and possibly to other informal (and formal) settlements elsewhere. Further phases will include solid waste collection points and encouraging entrepreneurship with regard to waste recycling and upcycling. The use of ecomachines (biomimicry wastewater treatment systems) for treating stormwater at source is the next focus area of the project, which is planned for construction on a section of land adjacent to the Groendal Secondary School soccer field. The team responsible for the project includes BiomimicrySA, Greenhouse Systems Development, Isidima Design & Development, Maluti GSM, WaterLove Projects, CORC, John Todd Ecological Design and the Freshwater Consulting Group. Large parts of the Franschhoek Valley could be declared Grade I and II Heritage Areas. In terms of the National Heritage Resources Act 1999 (NHRA), a heritage inventory for Stellenbosch Municipality is long overdue. 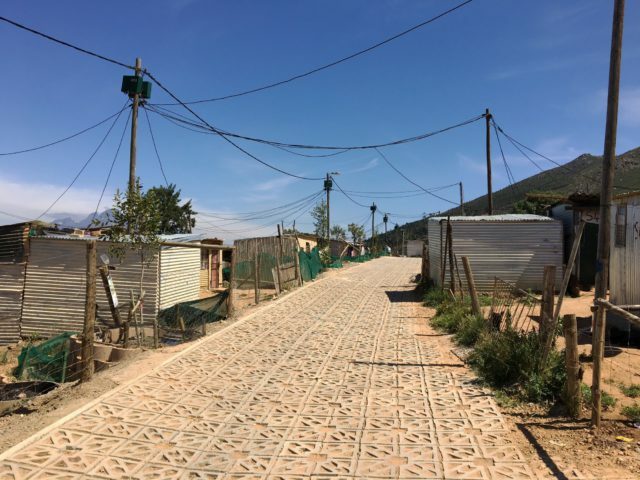 The municipality has now commissioned Cape Winelands Professional Practices Association (CWPP) – a team of heritage experts led by Fabio Todeschini and Liana Jansen – to compile this. Heritage resources – which includes Heritage Areas – are graded as Grade I, II and III for their national, provincial or local significance and placed on a Heritage Register. In November 2016 CWPP presented a Preliminary Draft Inventory of Large Scale Landscape Areas in the municipality (Phase 2a). It is available at www.stellenboschheritage.co.za. 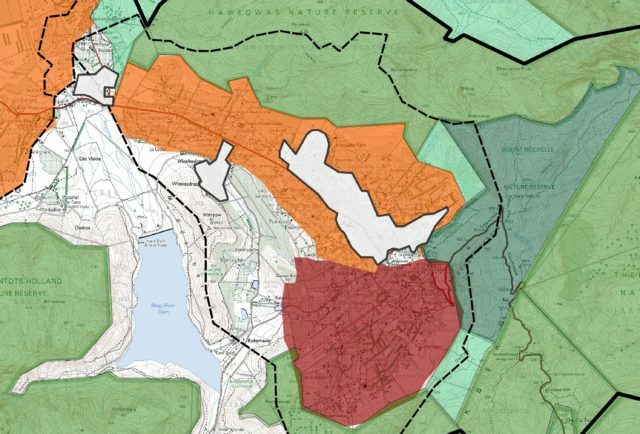 It proposes that in the Franschhoek Valley the maroon coloured area (see plan) should be a Grade I Heritage Area and the orange coloured area should be Grade II. As the official Conservation Body for the Franschhoek Valley the Franschhoek Trust & Ratepayers Association (the Trust) was asked to comment on this draft. It suggested that the black lined area was of equal heritage significance to the proposed Grade I Heritage Area and should also be considered for Grade I status. In doing so it emphasised the heritage significance of La Cotte Farm and the landscape in which it was set. The Trust also proposed that the Municipal Spatial Development Framework 2013 be amended because it provided for Franschhoek’s urban edge to be extended to include a significant part of the black lined area – 59 ha – to be designated as a “New Development Area” to promote “mixed use, mixed income development including social and gap housing” as this might be incompatible with its status as a Grade I or Grade II Heritage Area. CWPP have submitted the Phase 2a Heritage Inventory to SAHRA and HWC for approval and will now draft Management Plans to be discussed with them and the municipality before the inclusion of the Heritage Areas in the Heritage Register becomes official. The municipality must then pass by-laws for their protection approved by SAHRA, HWC and Province within 6 months. In acknowledging the Trust’s comments Todeschini said, “Our Phase 2a work focussed on the broad brush-stroke identification of significant heritage resources in the Wilderness and Rural Domains. Phase 2b, starting in the New Year, will span the Urban Domain” and will include Grade III Heritage Resources in Franschhoek. It must be completed by July 2017. CWPP want local participation at workshops “drawing our attention to specific sites and areas that have heritage significance”. The Trust welcomes development that respects the heritage of Franschhoek and the Franschhoek Valley as an essential economic driver. The Heritage Inventory will be a vital tool to help protect Franschhoek and the Franschhoek Valley from further inappropriate development. If you would like to be involved in this or have anything to contribute, please contact me. Stellenbosch Municipality announced in early December 2016 that it had achieved another clean audit for its 2015/2016 financials. A clean audit means that the financial statements are all in order with no issues on the predetermined objectives, no problems with non-compliance to key legislation or any significant deficiencies in the internal controls of the municipality. The mayor also thanked the Chief Financial Officer, Marius Wüst, and the other officials who work to ensure that the municipality complies with the prescribed legislation at all times.